Pink was the happiest loser after Sunday's 2019 Grammy Awards. The pop star was nominated for Best Pop Vocal Album for her 2017 album "Beautiful Trauma," but lost to Ariana Grande who took home the coveted prize for her album "Sweetener." Pink still received a Grammy: a homemade one from her daughter Willow, 7, and her son Jameson, 2. "Thanks Kids :) my favorite kind of award," the three-time Grammy winner wrote on Instagram on Sunday night alongside two photos of Willow and Jameson holding up a Grammy made out of aluminum foil. The singer, who did not attend the ceremony, added on Twitter that she thinks it's "kind of rad" that she lost her 20th nomination on Sunday, writing, "I'm always honored to be included. Now to get this sick baby in the bathtub. Congrats to all the nominees! Have fun tonight." Pink joked on "The Ellen DeGeneres Show" last week that every time she loses her family makes her a Grammy out of tinfoil. "So, this will be my 17th tinfoil Grammy on Sunday," she said with a laugh. 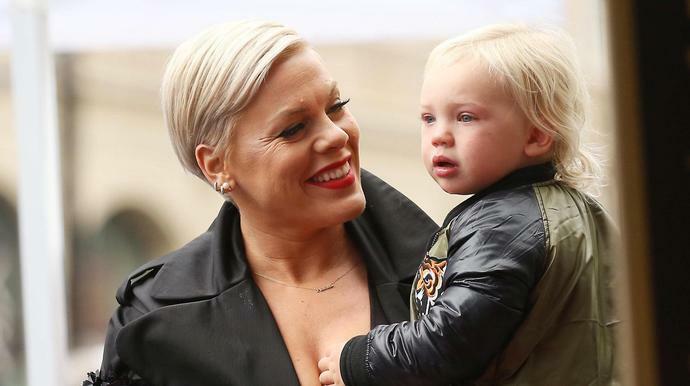 "Today for me is a celebration of something that my dad taught me, and that is 'To thine own self be true,'" Pink said. "You may not be the best that ever did it, you may not be the prettiest or the tallest or the funniest or the most talented or whatever you tell yourself that you're not," she continued. "If you don't give up and you work really hard ― no one else can ever be you."